Residential Overhead Door Pricing - Michiana Building Supplies, Co.
All overhead garage doors are complete with track and hardware. Delivery is available throughout Southwestern Michigan and Northern Indiana. Delivery charges may apply. Lead time on overhead garage doors is approximately 2 weeks, depending on style and color. 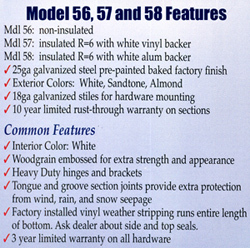 All prices are picked up here in Niles, Michigan or at the manufacturers facility in Warsaw, Indiana. Doors 16 feet wide and larger must be picked up directly at the factory. 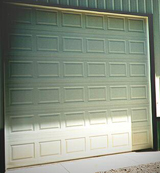 All garage doors are made-to-order and are generally not returnable. Prices do not include delivery or freight. Please give us a call at (269) 683-2723. Monday through Thursday 8:30 a.m.
Saturday 8:30 a.m. to 11:00 a.m.
Michiana Building Supplies, Co. and/or its affiliated Subgroups make no representations regarding the suitability of the information contained in the documents and related graphics and/or "missions" published on this server for any purpose. All such information, documents, graphics, or "missions" are provided "AS IS" without warranty of any kind and are subject to change without notice. The entire risk arising out of their use remains with the recipient. In no event shall Michiana Building Supplies, Co. or its individual Members be liable for any direct, consequential, incidental, special, punitive, or other damages whatsoever. Including, without limitation: damages for loss of business profits, business interruption, or loss of business information, even if the Michiana Building Supplies, Co. has been warned of the possibility of such damages. All sales subject to terms set forth by Michiana Building Supplies, Co. Michiana Building Supplies, Co. is a Michigan Corporation.